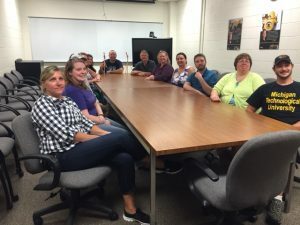 Over the summer, Michigan Tech presented the increasingly popular teacher professional development course, The Engineering Process. The course was developed by Professor Emerita Sheryl Sorby, and has been taught since 2001. The Engineering Process has grown more successful with the rise of the new Next Generation Science Standards (NGSS), which aims to transform how K-12 teachers introduce basic engineering concepts to their students. The teachers participated in the rigorous two-week course, which assisted in the development of curriculum to bring back to their classrooms this year. Aside from the fundamentals of engineering, the course also covered issues such as energy, infrastructure, and transportation. The Engineering Process was generously funded through the Michigan Science Teaching and Assessment Reform (Mi-STAR) project, which is developing and testing a new integrated science curriculum that are aligned with the NGSS. “Mi-STAR is a perfect fit with what we’re doing,” said Professor John Irwin, “We’ve known all along the importance of getting kids interested in engineering before they get to college.” The summer institute was coordinated through the Department of Cognitive and Learning Science’s Teacher Professional Development program.